Making a flap book is fun and easy! Tomi and Mimi love to read flap books. They like to discover the pictures hidden behind the flaps. They like it so much, that they decided to make one themselves. This is a nice craft to do on a rainy afternoon. It also makes a lovely present for a friend or a newborn baby or someone else you want to surprise. It is not at all that difficult, but you will need the help of your parent or a grown up. First, Tomi and Mimi cut paper in the right size. Then they decorated one side of each page with farm animals. 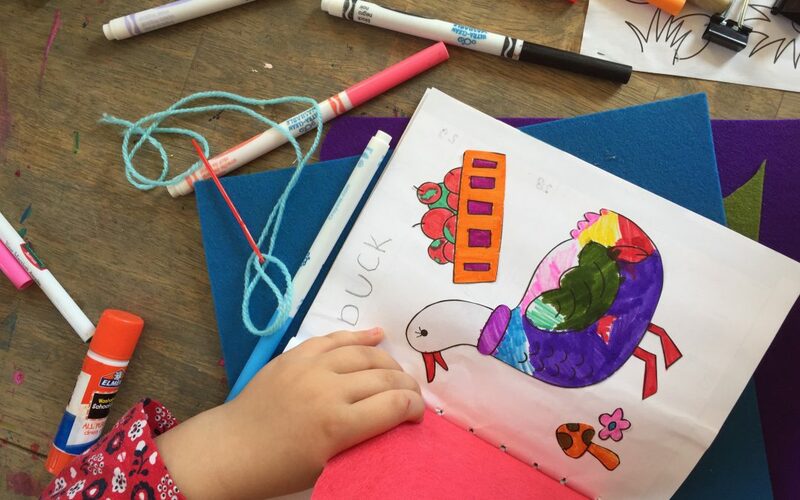 You can draw your own animals or cut and color from a coloring page. Second, they cut pieces of felt so that it covers the drawings. Fourth, with thick yarn, they sewed the book together. Your parents can help if that is too difficult. You can also let your parent or helping grown up staple the book. And there it is! Your very own flap book with felt flaps. Tomi and Mimi were very happy with their beautiful book. They even wrote the names of the animals! Here Mimi shows you her book. We hope you enjoyed our book making post! Make something pretty for yourself or someone else. Bye from us and our flap book! © Tomi&Mimi 2017. All rights reserved.